This thing has become a beast and is taking a life of its own. I originally identified ten areas of interest for a megadungeon. I came into this cold and with no idea for where it would go. Then I decided to drill a little deeper and see what happened. So far, I’m really happy with how it’s turning out. 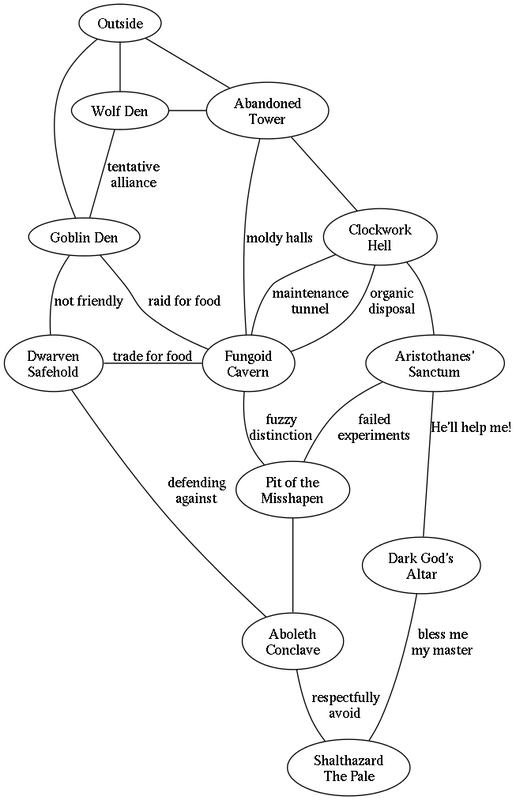 A few things went in directions I would not have expected or assumed (the Goblin Warren and the Wolf Den in particular) as I found ways to flesh them out and link them to other things in the megadungeon. I’d originally pictured something more malicious with the Clockwork Hell, but “it’s just broken” seems to fit pleasing well. I haven’t done an entity definition for the megadungeon as a whole. Normally that would be done somewhat before I even started on a dungeon as a whole, but because I was starting cold I skipped it. It has been observed (shortly after I posted about the Abandoned Tower, Aristothanes and the Clockwork Hell) that there was a vibe of “science gone wrong”, and I can work with that. It caused the Fungoid Cavern and the Aboleth Conclave Outpost to start to gel in my mind. I’ll write about them soon… probably really soon, I’m almost out of other things to write about! I haven’t found the need to add more regions, or even remove any. As disjoint as the individual regions are, they still seem to fit together. The amount of work required has been grossly disproportionate to the amount of play I expect I could get out of this. I reckon I’ve spent 15-17 hours total so far, to devise the initial outline and six of the ten regions. I could have the entire thing wrapped up, at the level of detail I’m working with, in under 25 hours total. I could use this to improv a game for a year or so, just with what I will have done by, say, the end of the weekend. Aristothanes might be a bit of a trick (wizards are not only cunning and tricky, they can be a pain to write up in D&D), but apart from that I could probably mostly stick with common creatures straight out of the monster book. I could run this using just about any flavor of D&D I have experience with, OSR or not. I’m not as comfortable with other systems since I don’t play them as much, but given that at this point there are almost no mechanics whatsoever in here it would be dead easy to adapt. A megadungeon sufficient for a year-long campaign created in seven days, starting cold. Slightly more than half a week if I were working on it full time (or honestly less, since I’ll admit I haven’t been giving this my full attention). Something that excites me even more, this series is proving to be remarkably popular. Not only have I see a big traffic spike on my site, but I’m seeing a lot of favorable comments online and in other blogs. I’ve been asked if I will be packaging this series into a PDF or something. Maybe pop it up on RPGNow or something. I might. What do you think? It’s looking good! Will there be a full graph of all the rooms at the end? Should be good for some wow factor. I would go for a PDF if you do one. As you may notice, I’ve put up an intermediate full graph and do plan to present a complete one when I’m done, and probably a better one (I’m not happy with some of the node placement, but won’t mess with tweaks until I’m done, they’ll just break). If I do package a complete PDF I’ll even make sure there are pretty maps. You’ve got something really excellent here. I am totally in love with this approach (I’m a preparer at heart, but I also love to be surprised by PC actions). I think a PDF would be awesome – make it like a workbook that the reader can use step-by-step to create their own megadungeon. I hadn’t really considered that, Victor Von Dave. There really isn’t much to do by way of a workbook. I was thinking of bundling it for use as the skeleton for a megadungeon. Provide much the same information I have here so people can build on it and adjust to their own campaigns (or take it and improv). Perhaps expand a bit and be a little more specific (such as naming more names), but I would expect that to be filed off and replaced by campaign-specific things. I suppose a default to start with would still be good, though. Include a section describing the process I used and a template worksheet (Word, Libre Office) so people can make a jump on their own? Maybe, maybe.